Since I decided to revive my interest in ship in the bottle builds, I revisited my original first kit builds from the “Ships A Sailin’” line from the 1970’s. My first ever build was their “Lively Lady” and my second ever build was another of their kits. I pulled out the instruction sheet that I still have from this series which has no identification for the ship on it. For many years I was under the impression that this build was their “Skeeter” but after finding an old kit for sale I realized that I had actually built their “Goja”. I first started to perfunctorily build this ship accordingly to the dimensions I had on the instruction sheet when I remembered that I was never quite pleased with my first result. I had given this build away as a gift so I no longer had it for reference. I looked at the squat dimensions of the whole ship on the instruction sheet and the cautionary words that the model had been modified to adapt it to the bottle when I wondered if this was actually a historical representation. At the time I had no idea what the “Goja” was, my “Lively Lady” certainly wasn’t a historically accurate ship so I assumed that this was another fanciful creation. After a cursory investigation, I was hooked. The “Goja” is the ship that Norwegian Explorer Roald Amundsen sailed to make the first successful voyage across the North West Passage in 1906. The ship still exists today in a museum in Fram, Norway and previously had spent many years in a park in San Francisco, Ca so it is well documented and photographed. I managed to find a sail and rigging plan and pulled up a few photos to help me get as historically close to the ship as possible. I even watched a video documentary about the Arctic Explorers and the quest to find the North West Passage. After Amundsen completed the passage, he landed in Alaska and had to Nordic ski 500 miles just to send a telegraph to announce his completion. I was so impressed with this story I decided I had to do this model due diligence and effort. 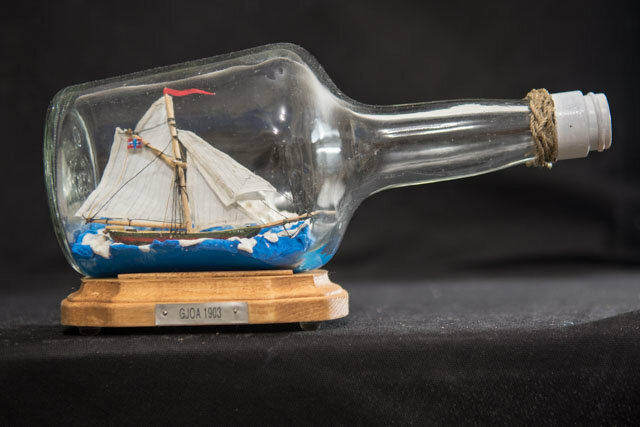 I didn’t want to end up with a “bottle with a ship model in it” I wanted a “ship model that happened to be encased in a glass bottle” instead. I found a nice bottle in my collection that complemented the dimensions of the plan although it was a bit challenging to work in. I tried to match the color scheme of the hull, I made a nice suit of sails from cloth instead of paper (I really prefer the cloth sails to paper now), I took some care with trying to make a flat Arctic sea with ice floes and an Arctic tundra backdrop and I sealed the bottle with a Scandinavian coin (OK, it’s Swedish, not Norwegian and it isn’t from 1906 but it looks cool) and made another “decorative braid” knot for the neck. I even tried my hand at a miniature Norwegian flag to fly from its ensign line. Had I had the presence of mind, I would have made a Norwegian flag of the banner but the flag was an afterthought. Most of these details are not visible in the photograph. After it was completed it struck me how the bottle mounted on its side mimics the silhouette of the ship with the neck being its prow. So here it is, my homage to Roald Amundsen, my eighth ever SIB.